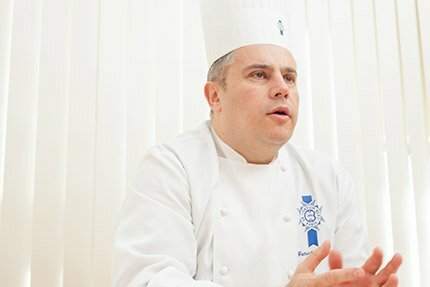 Since coming to Japan in 2006, Chef Patrick Lemesle has spent almost 10 years in the country. He loves Japanese culture and ingredients, and this time he chose sakura (Japanese flowering cherry) because it is an ingredient in which you can literally feel Japan. 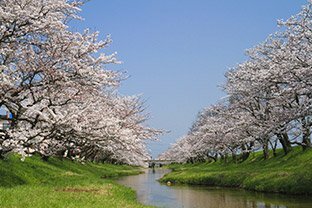 Sakura is a quintessential seasonable ingredient in Japanese cuisine. Chef Patrick is passionate about all four seasons in Japan. However, his favorite season is spring. So, he chose a spring ingredient as the theme for this article. Every year he goes to the neighborhood park and enjoys hanami. He is enthusiastic about expressing through food such a cultural symbol of spring in Japan. Chef Patrick has made a “sakura macaroon” this time. This confectionary is certainly a beautiful cherry color with a lovely appearance. According to Chef Patrick, when you savor this with champagne as an aperitif, still more harmony is brought forth. “I got a hint from salted cherry buds. I was fascinated by the intricacy of the salty taste.”Sprinkle some Japanese-made salted cherry buds with powdered sugar by hand. Let this dry. Then brush off the excess salt and sugar. 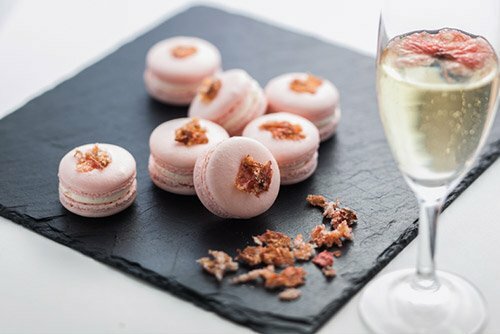 After doing this extra work, garnish the macaroon with his original cherry buds. The affinity with champagne is exceptional. This sakura macaroon has the scent of spring. Together with sakura floating on champagne, we would like for you to experience the feeling of spring in Japan. Pickled cherry blossoms are made by pickling with salt the flower buds of, in general, Yaezakura (a double-flowered cherry tree). For generations, the Japanese people have used pickled cherry blossoms to drink sakurayu(salted sakura bud tea) for celebrations, and it is also used for sakura mocha, inarizushi, and as a topping for onigiri (a rice ball).